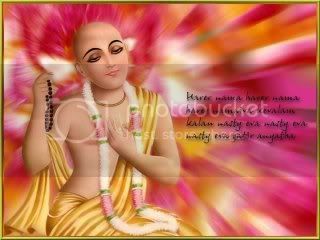 Saturday the 19th of March is the appearance day of “Lord” or “Shri” (most beautiful and auspicious) Chaitanya Mahaprabhu. The disciples of Shri Chaitanya have found ample Vedic scriptural references indicating that Shri Chaitanya is God, and more confidentially, is the aspect of God known as Krishna, the original, all-attractive Source. Shri Gaura (fair or golden complexioned) or Gauranga, as Shri Chaitanya is also called, is considered by his followers to be the incarnation for the present time we live in. This period in history is referred to in the Vedas as the Iron Age of Kali since it is the least fortunate period in the cyclical view of Vedic cosmology consisting of four ages. We might also consider it the winter of human civilization. So-called technological advancement notwithstanding, the time we live in is full of quarrel, hypocrisy, strife, anxiety, disturbance, environmental degradation, and lack of spiritual inclination. Looking at the world situation I think many would agree to this as a valid observation about the world situation, and even in many places in our own country. However, within this difficult age comes the special blessings of Chaitanya Mahaprabhu! The incarnation of Lord Chaitanya is both complex and simple. Looked at simply, He is a primary aspect of God, who portrays Himself as a devotee of God, to teach us how to be joyful, happy, peaceful, and fulfilled, by obtain the highest benefit. Understanding the disqualifications and disturbed nature of the people in general, Shri Gauranga has brought the easiest method of self or God realization. Though it is easy, it gives the highest benefit, love of God. His method of spiritual awakening is through the congregational chanting of the holy name of God. In addition, he also gave the soft repetition of God’s names (Japa) chanted on prayer beads as a personal meditation and way to constantly remember the Lord. We might call Him the Kirtan Avatar, or the incarnation who came to give chanting and dancing as the yoga of divine union with God. Primary names of God refer to those names of God in relationship to the spiritual world with his pure devotees. Although He loves all souls, he especially loves and notices those who serve him directly in pure love. The material world is for those souls who don’t want to acknowledge the supremacy of God, or serve or love Him. Out of His kindness, such rebellious souls are given material bodies with senses, a mind, and conditioned personalities to contend and struggle with, in competition with other souls who also want to enjoy the same apparently scare material resources. Secondary names of God refer to his relationship to the material world and conditioned souls, such as Creator, Maintainer, or Destroyer, etc. Lord Krishna and Lord Chaitanya are both in the category of God and are very complex theological persons, yet of the two, Lord Chaitanya is more approachable, since he is taking up the role of a devotee of Krishna to teach us by his example. Krishna is certainly merciful, but Shri Chaitanya is much more so. We can think of all the different incarnations as merciful, yet some are more merciful, and a few, most merciful. Most merciful means they give the greatest obtainment for human beings to the most unqualified. Chaitanya is also referred to as Krishna Chaitanya, which means Krishna consciousness, since Chaitanya means life force. 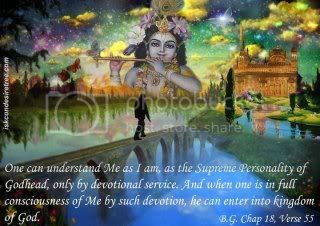 So if we are going to understand Shri Krishna, we have to do so through Lord Chaitanya. First the giver, then the gift. Of course, we hear about either Krishna or Chaitanya through those who are their devotees and who speak and write books about them. 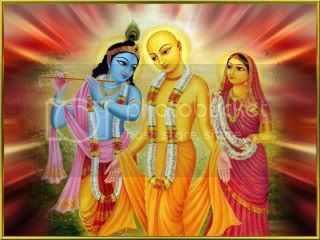 Thus devotees of Lord Chaitanya are expansions of his mercy, being his representatives in the world. Even more confidentially, Lord Chaitanya is Krishna, in the special mood of His greatest devotee, or shakti (devotional energy), known as Shri Radha, who is the female counterpart or “counterwhole”, since she is one with Krishna as his energy. Krishna is the Energetic Source, compared to the sun, while Radha is His energy, or his primal power from which all other energies expand. We living entities or souls are tiny sparks of Krishna’s energy, called marginal energy, that are a product of our association. By associating with Krishna through his holy names and service, and with those who are dear to Krishna, our nature changes through spiritual association. The process of bhakti or Krishna consciousness means changing the quality of our association from material to spiritual and reviving our eternal love of Krishna. Since Shri Chaitanya is the personification of Krishna consciousness, we really can’t divorce Chaitanya from Krishna. If we are to appreciate love of Krishna, or Krishna prema, as the most valuable thing, then we have to study who Krishna is. Otherwise, why should we try to love him, or think loving Krishna is any big deal? Studying the life of Lord Chaitanya we discover that he was mad in love for Krishna. This love sustained and nurtured him, as it has for generations of his followers over the last 500 years. On such days as this, we are meant to ponder about whom Shri Krishna and Shri Chaitanya are, and wonder about the spiritual perfection they offer to us. Lord Chaitanya and his followers have come to teach us about our eternal nature as souls and give us the most effective means for realizing our relationship with our Source, or that Supreme Person who we have been searching for life after life, the true love of our heart and soul. Submitted by arvindmahajan on Sun, 2011-03-20 14:43. Today, Krishna made me visit ISCON temple at East of Kailash, New Delhi. It was a surprise to me that I was planning to go some where else and sudden change in plan made me seek darsan of Krishna at the evening Aarti. Prabhu ji, few years ago when I read the biography of Srila Prabhupad, I remember there came a stage in his life when he was away from his family totally devoted to Krishna and his all money was gone and had marital discord too. Then Prabhupad said, when Krishna loves someone he does this to his devotees. Is this love test happen to every one? I have started Mahamantra Jaap (intially 2 rounds) from today itself. Prabhu ji, please tell me what Krishna wants. Is he a very strict God who gets annoyed at mistakes like many other gods. I came to know that Sri Krishna had 16 kalaas whereas prabhu Ram had 12. Which 04 did Sri Rama lacked or didn't disclose. I have faith in him but a bit scared of his loving tests. Because of curosity, I want to ask more and more so that what I pray, whom I follow, whom I worship should be known to me from core of heart. Your experiences and guidance will undoubtedly make me strong thats my belief. So, please keep on guiding me. Submitted by Karnamrita on Wed, 2011-03-23 09:25. Arvind. Pranams and Hare Krishna. Krishna is supreme mercy, and Chaitanya is still more merciful. I don't know your religious history or training, but in Gaudiya Vaishnavism, or the path given by Chaitanya Mahaprabhu and his followers we understand Krishna and Chaitanya as identical...they are svayam Bhagavan. They are not out to "get" us but to help us make spiritual advancement. They respond according to our desire to obtain and love them. We have to pray for the faith and realization that whatever they do is for our highest good, to help us take full shelter of them. Prabhupada is a pure devotee, so Krishna dealt with him in a certain way. Many of us who came to his mission where in an extreme existential crisis and in the course of our life, nothing else seeming a valid path except surrender to Krishna and joining the mission. For all of us it is a gradual process. Never the less, it is good to understand the high standard of pure devotion, even though you may feel far from it. We can't hit a mark we aren't aiming for. You don't have to give up your family life or occupation to be a devotee. However, you need to try to dovetail your life for Krishna's service and the service of his devotees. Then your life at home can be an asset to your spiritual progress and not a detriment. Dedicate the results of your work and family to Krishna. See yourself and your family members as his servants. See your home and very self as Krishna's property. Offer some portion of your income or wealth to his service in order to purify your income. Read Bhagavad Gita and other scriptures daily, praying to understand their meaning in a practical way, and seek out devotees who have a spiritual taste and standing in bhakti. Remember that Krishna is our dear-most friend and well-wisher!